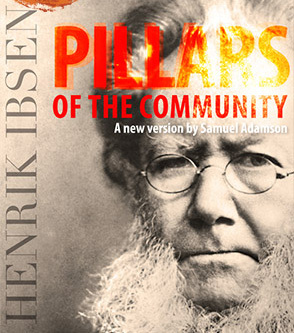 Elements Theatre Company of Orleans, MA, will close its 2012 season with “Pillars of the Community” by Henrik Ibsen, adapted by Samuel Adamson. Celebrating its 20th year of performing both classic and modern works, Elements will present this rarely staged masterpiece in six performances only from November 23 - December 2 at the Paraclete House, Rock Harbor, Orleans. “Pillars of the Community” is a penetrating sociopolitical drama that explores the impact of one man’s questionable past on his current role as a civic leader. Given the particularly contentious campaigning that marked this election year, the timeless questions posed by the play are as relevant now as they were when “Pillars” debuted in 1877. What defines a man's character? When is a lie better left untold? How does a leader’s personal life affect his public duties? What can be said about the conscience of a nation that demands its leaders be flawless, then criticizes them for being inhuman? With an unflinching eye, Ibsen bares a community’s hypocrisies and holds the mirror up to its citizens as well as its leaders. The play's central character, Karsten Bernick is a charismatic visionary who works hard to develop and expand the influence and economic reach of his small Norwegian fishing village. But he harbors a long-buried secret that threatens to surface and ruin his standing in the community. Will he choose a financially secure future or should he reveal his past to obtain the peace that seems to elude him in his daily life?